The Rotorua Government Gardens are unique among world parks. In the Rotorua Government Gardens, you can belt a ball around a golf course fringed with bubbling mud pools, play a game of croquet or bowls, stroll among beds of roses, perch on the edge of lily pond, browse in a museum or soak in a spa. You’ll find the Rotorua Government Gardens on the edge of the lake, just a stone’s throw from the CBD and on the doorstep of some of the city’s best hotels. They’re a mecca for tourists and a favourite spot for locals. Originally known as Papaekumana, the Rotorua Government Gardens’ site has always been of great significance to the Tangata Whenua, or local people. Many important battles were fought here and many great chiefs and warriors came to bathe in the hot currents at the edge of the lake or in the healing pools hidden in the scrub. The place is rich with legends and stories. Towards the end of the 1800s, the Tangata Whenua gifted 50 acres of Papaekumana to the crown “for the benefit of the people of the world”. The land was cleared and formal gardens were laid out with the Japanese firs and the Californian Redwood that remain today. Before long, the Government saw the opportunity to develop the gardens as the South Pacific’s answer to the spas of Europe. In 1908, the magnificent Tudor bath house welcomed the first tourists seeking to “take the waters”. In 1901, the ornate arch made of local totara wood and representing a stylized crown, was installed at the entrance to the gardens. It was built in honour of the visit of the Duke and Duchess of Cornwall and York (later King George V and Queen Mary), but has always been known as the Prince’s gate. In the early 1930s the Blue Baths were opened. The ornate Mediterranean style building was inspired by the swimming pools of Hollywood and the people who came to bathe there were seeking pleasure and fun rather than cures. The Blue Baths enjoy the singular fame of being the first public swimming pool to allow mixed bathing – men and women, that is. The Rotorua Government Gardens remain a piece of Victorian England parkland, albeit on the fringe of a uniquely Aotearoa landscape. The gardens themselves have changed little and the grand old Tudor Bath House and Blue Baths buildings have been beautifully maintained and restored despite a number of different lives . 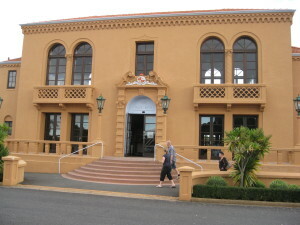 The Bath House, after a turn as a restaurant/nightclub, is now home to Te Whare Taonga o Te Arawa (the Rotorua Museum) The Blue Baths, closed to bathers for many years, during which it operated as a restaurant, functions centre and nightclub, now houses a cabaret and swimming pool. People still come to “take the waters” in the Rotorua Government Gardens, but they take them now in re-vamped state-of-the-art pools at the Polynesian Spa. Read about the Polynesian Spa in the next post. To truly understand and appreciate Rotorua, you need to know at least a little of the forces that have shaped it. 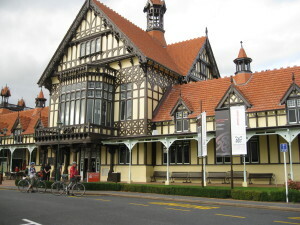 The best place to find out about them is the Whare Taonga o Te Arawa, or the Rotorua Museum. Located in the old Tudor bath house in the Government Gardens, Te Whare Taonga o Rotorua is a treasure trove of information on the region’s volatile volcanic landscape, vibrant Maori culture and fascinating history, as well as the people who have made it their home. 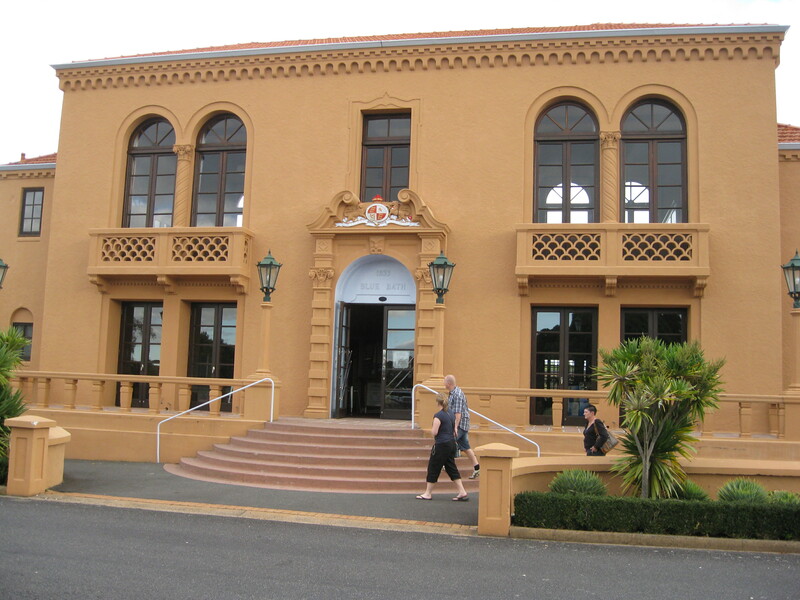 When you enter Nga Pumanawa o Te Arawa (the beating hearts of Te Arawa) on the ground floor, you’re in the world of the Te Arawa Iwi (the local tribe). Interactive multi-media displays trace their journey across the vast Pacific and through the centuries to modern day Rotorua. You’ll see how the environment shaped their way of life and hear the myths and legends that explained and ordered their world, including the poignant tale of Rotorua’s own star-crossed lovers, Hinemoa and Tutanekai. You’ll meet their chiefs, their respected elders and even some of their arch enemies. You’ll learn how European settlement and tourism changed their lives forever. A special exhibition and a film tell the bold, brave, lucky and, all too often, tragic stories of the Te Arawa B Company of the Maori Battalion. 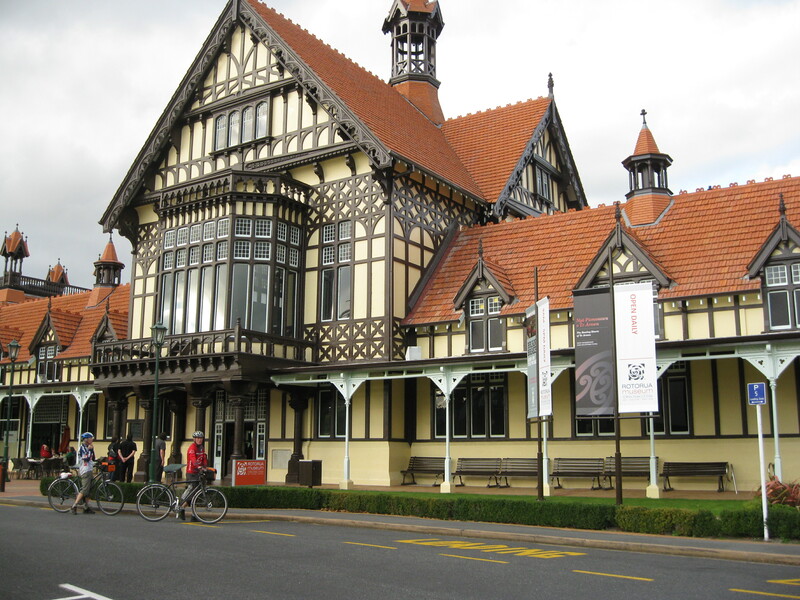 Displays of exquisite taonga; art, carving, jewellery and clothing show the skill and craftsmanship of generations. The Museum’s cinema experience, also on the ground floor, gives both the scientific and the mythological explanations for this amazing volcanic region. It shows the stunning Pink and White Terraces and then subjects the viewer to a somewhat unsettling sensurround portrayal of the eruption of Mount Tarawera. Down in the bowels of the building, you can explore the baths and treatment rooms of the “Great South Seas Spa” which operated here in the late 18th and for half of the 19th century. You’ll also and hear all about the bizarre therapies it offered! For those with an interest in engineering and architecture, the labyrinth of pipes and the vaulted ceilings are a must see. Climb the sweeping staircase to second floor and you’ll find an exhibition dedicated to the time when the bath house was Tudor Towers, a cabaret restaurant. All the great names of local entertainment did a stint there. There are storyboards and photo displays and some great memorabilia. Climb further on up through the attic and from a viewing platform high on the roof you can take in the view of the lake and the city and inspect the Tudor exterior of the Great South Seas Spa.